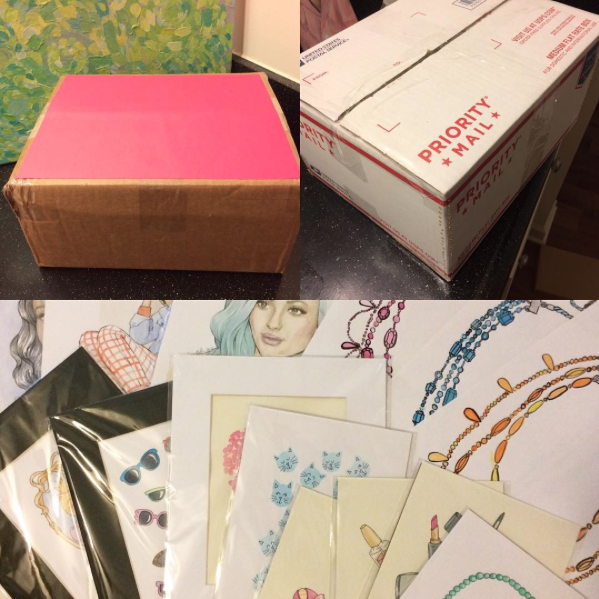 The Spinsterhood Diaries: My Very First Mystery Boxes! A couple weeks ago I watched a video about ordering Ebay Mystery Boxes. Spoiler alert, most of the things she got were garbage. However, I later watched a video of an Etsy Mystery Box, and it was much cooler. Most of the items in the box were for those fancy planners, but it was still a fun box to open. Since I've been packing up my apartment (one room of which has served as an art studio), I've found a lot of art and things lying around. They are not garbage, but I'm not sure how much of my own art I need to be hanging in my own home. So, I decided to make my own Mystery Boxes! Each of the boxes I've made so far contains at least five pieces of original art (by me!) as well as some other fun things I have stock piled around here. Sometimes it pays off to be a little bit of a pack rat...well, at least it pays off for the people who are getting these boxes. I've already sold the first one I made, but there's one left at my Etsy store. Today I'll need to run a few errands and will pickup some larger envelopes that can fit some of the 11x14 piece I have left. Then I'll post a couple more Mystery packages! Stay tuned!